I'm curious how to make pasta (and in this case I'm talking about say, spaghetti, angel hair, shells or lasagna noodles, no filling) and store it dry like I would find in a box at a store. I would try to take a day where I have not much to do and make ~25 pounds of pasta for the year (or every six months, happy to keep food fresh) Should there be adaptations of a recipe? Or would any do? How would I go about storing pasta (without filling) without a freezer for long periods of time? Any standard pasta recipe (basically flour, salt, water or egg) should do. Unless stated otherwise, fresh pasta can be cooked right away or dried and stored for months. Cooking time will vary, of course, with fresh pasta done in a few minutes, dried in roughly the same range as store bought. 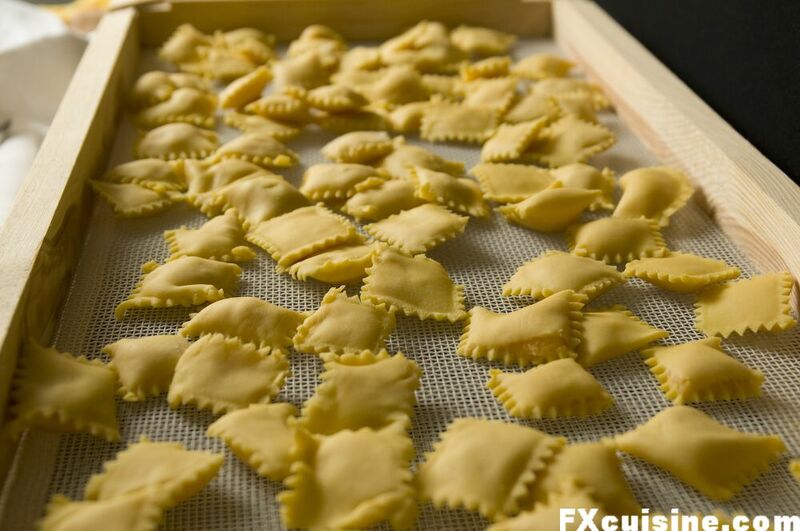 When drying pasta, use the same aproach as for laundry: Separation, dry conditions, slight air flow if possible. For long pasta, it's usually hung to dry, e.g. on (clean) broomsticks or poles, smaller shapes can be put in a thin layer on dish towels or table cloths, pro's use wodden frames with thin mesh, like one would for drying fruit. Tagliatelle are sometimes gathered into little nests (= 1 serving), then dried. 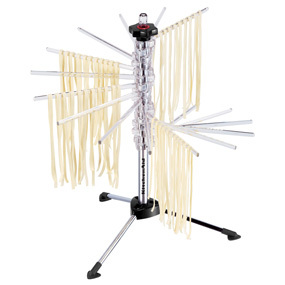 For pictures, search for "pasta drying rack". Usually you'll need about 2-3 days for pasta to dry thoroughly. Your estimated storage time of six months should be fine, even up to a year, but only for basic recipes with white flour. If you like to try whole grain, other grains (buckwheat, spelt) or more exotic flavours/colours (tomato, beets, spinach, curry...), I'd aim for three months just to be sure nothing goes rancid or looses colour. 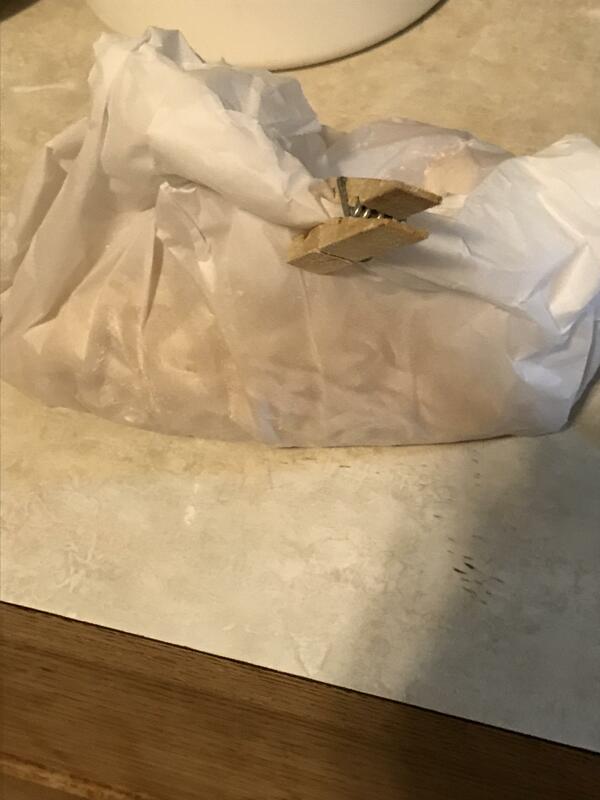 Paper bags (food grade) are ok, as is cellophane or plastic, but make sure the pasta is really, really dry, when packing in plastic. Store in a cool, dry , possibly dark (for coloured pasta) place. As previously mentioned, any pasta recipe can be dried out. Semolina only pasta will dry harder and faster than one with eggs. If you use spinach or other colorful ingredients, they can fade with time or sunlight. Of course, you could make something similar with a cheese cloth stretched across a frame, or new, clean, plastic screen from the hardware store and some artist's canvas stretchers. A dry day, and a low box or ceiling fan is a good idea too. Good luck if you have a dog. I, once upon a time, also had ambitions to dry lots of homemade pasta. I found it was much easier to make the dough in advance and roll it just before cooking instead. The appeal of doing it all at once, was to have someone else help me work the machine. 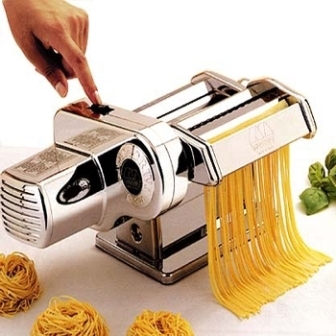 But a pasta-machine motor makes it easy to do this with one person. I do understand that dried egg pasta is a traditional way for farmers to preserve eggs. (and why Pennsylvania Dutch/Amish egg noodles are a thing) and if a bounty of fresh eggs ever fell into my lap, I might just try this again. I just made egg noodles last night & if wrapped loosely in parchment paper & generously dusted w/ flour they didn’t stick together. I’m assuming that if left in parchment they would dry & then could be stored in bags, plastic, paper or sealed in the parchment. I took them to a friends house, and cooked them 4 hours later & stores in the parchment w/ lots of flour none of them stuck together. Just make sure to flour generously & shake it off before cooking. I agree about storing or freezing the dough & making fresh. I’m pretty certain you’ll have a better tasting product. Not the answer you're looking for? Browse other questions tagged storage-method storage-lifetime pasta or ask your own question.